If there is a city in the world in which to enjoy the five senses it is Seville, and one of its greatest exponents is, without doubt, the neighbourhood of Santa Cruz. Getting lost in its streets is to appreciate the colour of a city, the flavour of history, the scent of its flowers and the closeness of its people. All seasons come well to Seville, but perhaps it’s in spring when it splendour becomes most apparent. Season of sun and flowers, scents and passions for a city and its passages like ‘el de agua' (that of water) in this district, maybe one of the most beautiful. It’s essential going for tapas in this neighbourhood and strolling through its streets, better by day. Request orange wine which is very good, although immediately tastes a touch sweet, and delicious Salmorejo. Beautiful streets! The neighbourhood of Santa Cruz was in medieval times, the Jewish quarter. It's great to walk in autumn or spring through the labyrinthine of narrow streets, small squares and enjoy tapas in their typical bars and cellars. I especially like their secluded squares: the Plaza de Santa Cruz, the Santa Marta square or that of the Cruces. 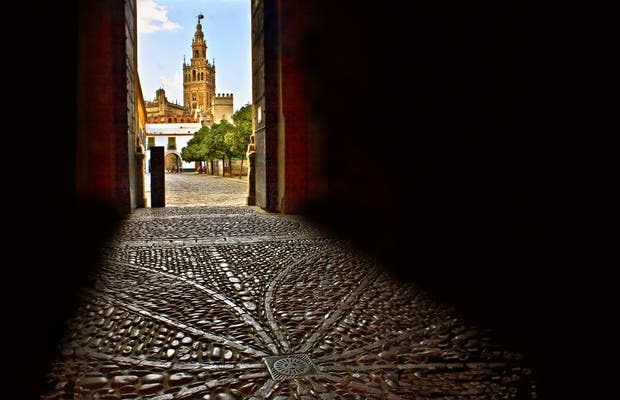 Surrounded by squares and internationally known monuments, you will be able to enjoy the Giralda, the palaces or the majestic cathedral of Seville. To take a break, go to the bars and cafés of the historical part of the city. Don’t forget to take a relaxing walk along the marvelous park of María Luisa and the powerful Plaza de España.